One The Movie ... Towards A Timeless Destiny ! 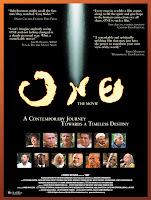 'One The Movie' is a spiritual documentary film featuring Deepak Chopra, Father Richard Rohr, Ram Dass, Riane Eisler, Thich Nhat Hahn, Sadhguru Jaggi Vasudev, Barbara Marx Hubbard, Robert Thurman, Llewellyn Vaughan-Lee, Hasan Quasdini, Father Thomas Keating, Scott Carter, Mantak Chia and many others. One : The Movie was created to increase awareness of the connections we all share. To remind us of our similarities and celebrate our differences. To allow the positive energy of Oneness to emerge in a world that too often seems disconnected and broken.